One of my favourite effects in art – and, if you are to believe Ed Ruscha and Dave Hickey after him, a criterion of all good art – is the “Huh? Wow!” effect. This phenomenon is opposed to the “Wow! Huh?” effect and its power holds true for life as well as for art. It requires little explanation and is best invoked through illustration. A case in point is Roman Ondák’s Loop, the work he has created for the Czechoslovakian pavilion at the Venice Biennale. As a Slovak, representing his nation in a pavilion named after a country that no longer exists, Ondák faced the challenges and absurdities of national representation through art – as well as the architecture and history of the Biennale’s original site in the Giardini Pubblici. National representation is a vestige of a colonial attitude some would have us believe is long gone, but which is still taken seriously by the curators and artists representing some nations – USA, Israel, Russia – as an opportunity to promote their own culture and heritage. For others – Germany, Denmark, the Nordic countries – it is a chance to challenge notions of nationhood, belonging and jingoism. But back to Ondák’s Loop, and why it was so effective. For a moment, walking into the Czechoslovakian pavilion, I questioned my memories of the past six years and periodic visits to the Gardini. Had there always been gravel on the ground inside the pavilion? No, surely not as I recall an installation some years back in which visitors could push perfect glass spheres around a smooth floor with their feet. Since when had this lush vegetation, semi-mature trees, and gently landscaped path taken over an otherwise minimal structure? 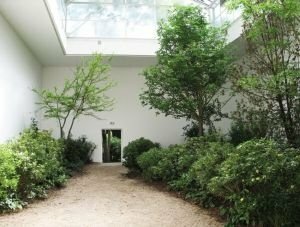 Doubt gave way to a priceless revelation – Ondák had invited the Giardini into the pavilion – eliminating doors, burying steps and enabling the ecosystem of the cultured gardens to take over the cultural ecosystem of the Biennale. Of all the works in the Giardini – and some, like Renata Lucas’s subtle sections of highway sneaking into the gardens and Arsenale were very slight indeed – Loop was the most quietly striking. Flouting the binary of interiority/exteriority, rendering the architecture of the pavilion dumb and useless, and letting many visitors pass by unaware, it dealt a gentle but fatal blow to nationalist bombast, and, by staging an invasion by its surrounding reality – the trees and bushes of the Giardini – it mutely denounced the shouting simulacra and initial wow-ness of some of the other national pavilions. This entry was posted on June 11, 2009 by ellendw.